It's been more than 200 years since explorers first reached the Pacific coast, and there’s still so much to discover! Aerial America: Pacific Rim Collection travels the westernmost part of the United States, an area still defined by unblemished natural wonders and an adventurous pioneer spirit. Witness Washington state, where America's wildest spaces and most modern cities stand side by side, and Oregon, shaped by its volcanic past but defined by its freethinking communities. From the Pacific northwest, travel along California via the Pacific Coast Highway, a road rich with historical significance and spectacular sights. Explore Hawaii’s emerald string of islands, from tourist hotspots to untamed regions accessible only by plane. 'Aerial America: Pacific Rim Collection' takes viewers on a majestic flight over California, Hawaii, Oregon and Washington, bringing the beauty of these varied locations right into their living rooms. On top of the stunning visuals, the program also provides a cornucopia of facts and trivia about each location. That's right, this disc is pretty and educational. So educational, in fact, that while taking notes for this review I suddenly had a flashback to my middle school days, when teachers would throw on a video and force us students to write down at least twenty facts to prove we were paying attention. Hell, about half way through I almost expected my seventh grade Geography teacher to suddenly appear glaring over my shoulder. As informative and visually appealing as the shows can be, the repetitive presentation can get a little old after a while, lessening their lasting value. As I said in my review for another set of travelogue programs ('Visions of Europe'), there just isn't a whole lot to these types of videos, and without any deeper substance they become rather forgettable. The series is separated into four episodes (about fifty minutes each) focusing on California, Hawaii, Oregon, and Washington. Each installment features breathtaking aerial footage of various natural landscapes and cities throughout the locations. A narrator provides a steady stream of historical and cultural facts throughout, as some fairly generic music plays on in the background. To the films' credit, unlike 'Visions of Europe,' I actually found a lot of the trivia to be pretty interesting, and thankfully the information is quite varied. In addition to standard bits of history, the program addresses the different areas' major forms of production with a heavy focus on technology. Environmental issues and alternative forms of energy are also frequently touched upon, capping off a surprisingly well rounded discussion. The California episode takes viewers on a trip down the state's famous Pacific Coast Highway. Stops along the way include Hearst Castle (the inspiration for Xanadu in 'Citizen Kane'), wine country, the Salinas Valley (the setting of many Steinbeck novels), and San Francisco. The Hawaii installment hops around the major islands detailing the beaches, volcanoes, resorts, waterfalls (including a spot used in 'Jurassic Park'), and… former sites for human sacrifice and leper colonies. Oregon takes audiences to the non-conformist paradise of Portland and highlights a few famous Oregon Trail spots (thankfully, nobody drowns, gets bitten by a snake, or dies of dysentery). The state's gorgeous Painted Hills are also spotlighted along with the Colombia River, a rock climbing spot called Monkey Face (it's a big rock that looks like a giant monkey), the Google server farm, the Cascade Mountains, and… ALPACAS! If you're wondering why I'm so excited about that last one, you've clearly never seen an alpaca. Last but certainly not least, Washington (setting of Billionaires, Bullets, Exploding Monkeys and Seattle On Ice) provides lots of spectacular views of a bright and beautiful Seattle (which is a far cry from its perpetually rainy depiction on 'The Killing'), along with impressive shots of Mount Rainier, the Hanford Nuclear Site, the Microsoft campus, Mount St. Helens, and the city of Forks… the setting for the 'Twilight' series -- a fact I'm not so sure the town is proud of. While I haven't exactly expressed a terrible amount of enthusiasm for travelogue shows like this in the past, I must admit I started to see the appeal a bit more as I went through these episodes. The images are really breathtaking, giving audiences sweeping shots and spectacular views that would otherwise be impossible to see. Though I've seen my fair share of California, this disc did successfully make me want to take a trip to Hawaii, Oregon, and Washington to visit all the impressive spots highlighted. Still, despite the pretty imagery and overabundance of facts, the shows are inherently light on real substance. As gorgeous as the images are, the one-note style can get very repetitive and a bit boring. Big fans of travelogues should find a lot to like here, but others might be turned off by the program's redundant nature. 'Aerial America: Pacific Rim Collection' is brought to Blu-ray by Inception Media Group on a BD-50 disc that comes packaged in a keepcase. After some warnings and logos the disc transitions to a standard menu. Viewers have the option to play all four of the programs back to back or individually. The episodes are presented with 1080i/AVC MPEG-4 transfers in the 1.78:1 aspect ratio. Though there are some relatively minor technical issues, the program's breathtaking visuals are a real treat to watch. The digital source is fairly pristine but there are some slight, yet occasionally noticeable artifacts. Shimmering, noise, stuttering and flicker are all apparent from time to time, and there can be a faintly compressed quality to some of the shots. Thankfully, these problems prove to be rather minor, and the strength of the visuals themselves shine through beautifully. Clarity is very strong, revealing all sorts of tiny, intricate details in the cities and landscapes down below. The various beaches, mountain peaks, hills, forests, and towns all offer a great sense of dimension with several real "wow" moments throughout. The images are wonderfully vivid, providing a rich atmosphere of sumptuous colors. The blues of the sparkling oceans and greens of the swaying grass simply pop from the screen. Contrast is high without blooming, leading to a bright, brilliant picture. Sharp-eyed viewers will notice a few sporadic artifacts, but they're nowhere near as obtrusive and distracting as a previous travelogue series I reviewed ('Visions of Europe') and I found them to be easily forgivable. Video quality really is paramount when it comes to a series like this, and the transfer does a nice job of realizing the stunning aerial views. The series is provided with English Dolby Digital 5.1 audio and no subtitle options. Basic yet serviceable, these mixes do little to enhance the experience but feature no glaring problems. Narration is clean and well prioritized, making it easy for viewers to absorb the various facts and trivia. Music ranges from wholly generic to pretty decent, but the overall lack of recognizable pieces is a disappointment (though Israel Kaanoi Kamakawiwoole's famous version of "Over the Rainbow" is featured in the Hawaii episode). There is some stereo separation across the front soundstage, but this really proves to be rather uneventful. Likewise, some music cues faintly bleed to the rears, but surround use is mostly negligible. With that said, a few brief, isolated instances of ambiance and effects (some crashing waves, flying planes) do add momentary bursts of immersion. Unfortunately, they are far too fleeting and inconsequential. Dynamic range is on the flat side and bass activity isn't much of a factor. While the real draw of programs like this is certainly the visuals, a more enveloping surround mix could have definitely helped to draw in viewers. As it stands, these lossy tracks simply get the job done and nothing more. Inception Media Group has put together a collection of… nothing. There are absolutely no supplements. Those hoping for some bonus footage are unfortunately out of luck. 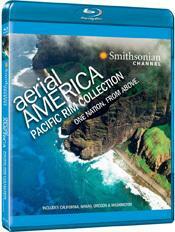 'Aerial America: Pacific Rim Collection' is a solid set of travelogue programs that provide stunning views of California, Hawaii, Oregon, and Washington. While I'm still not a huge fan of series like this, the narration provides some interesting information and the images are beautiful. The show succeeds in its goals, but proves to be a little too repetitive and thin for my tastes. Some very minor artifacts are visible, but the video transfer is quite strong regardless. The lossy audio mix, however, leaves a bit to be desired. With no supplements, this is a release that will likely appeal to big travelogue fans only.